We serve our community across the United States, Canada, and the world. The Order of Knights of Pythias is an international, non-sectarian fraternal order, established in 1864 in Washington, DC, by Justus H. Rathbone and was the first fraternal order to be chartered by an Act of Congress. 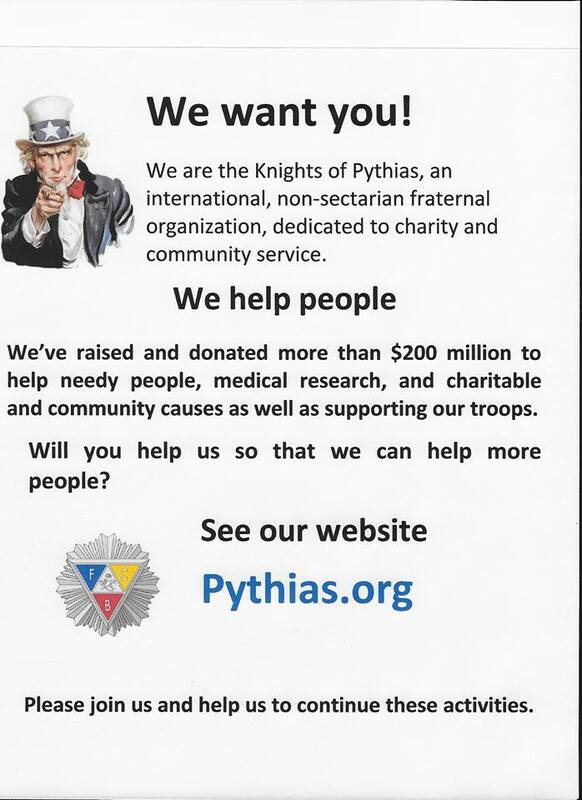 Thank you for visiting the website of the Knights of Pythias. The Order of Knights of Pythias, a great international, non-sectarian fraternity, founded in Washington, DC, by Justus H. Rathbone, in 1864, became the first fraternal organization to receive a charter under an act of the Congress of the United States after careful investigation by then-President Abraham Lincoln. 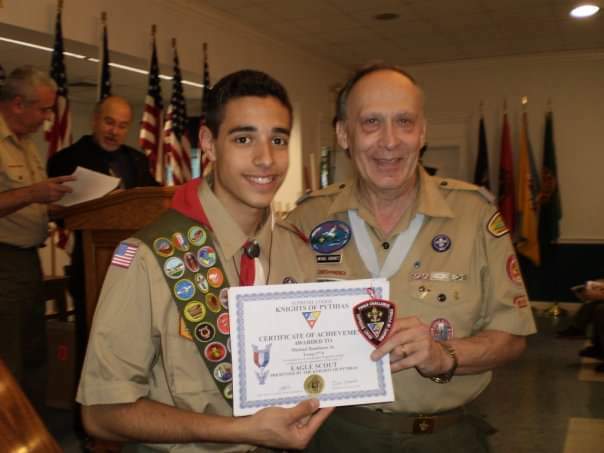 Our fraternal order follows three distinguishing principles, Friendship, Charity and Benevolence. Domains of the Order exist in most states and provinces, and subordinate lodges are located in many cities and towns across the United States, Canada and Europe. Our order bases its lessons and builds it ritual largely on the familiar story of the friendship of Damon and Pythias. These historical characters lived about four hundred or more years before the beginning of the Christian era. They were members of a school, founded by Pythagoras, who was known as the father of Greek philosophy. Their loyalty to each other, the adventures that beset them, and the outcome of this noble friendship, form the basis for one of the most beautiful stories of history as exemplified in our ritual. 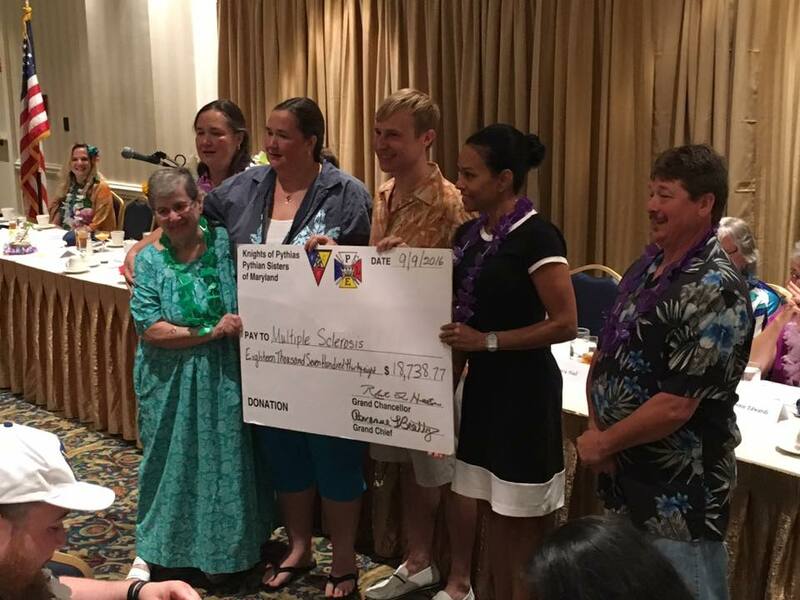 The Knights of Pythias supports charitable, benevolent, fraternal and social activities through its subordinate lodges, their members and the communities each services. 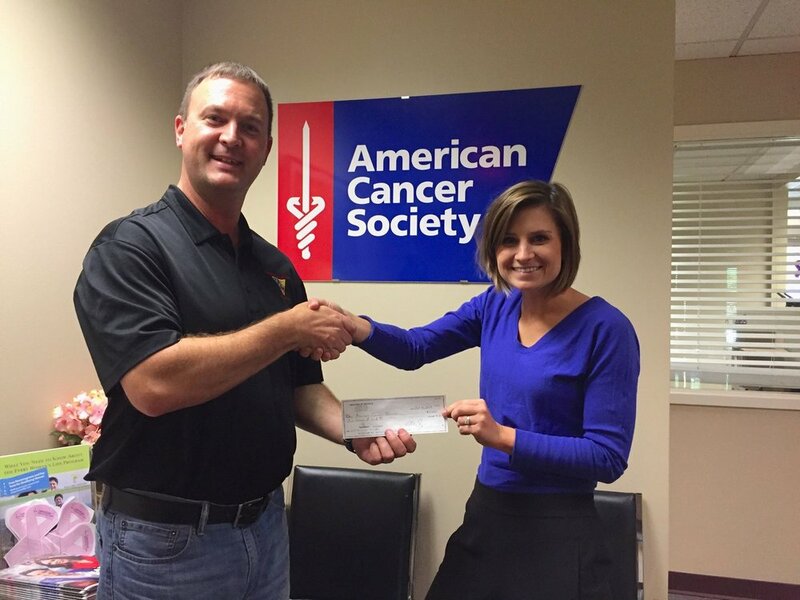 The primary charity supported by Supreme Lodge is the American Cancer Society. 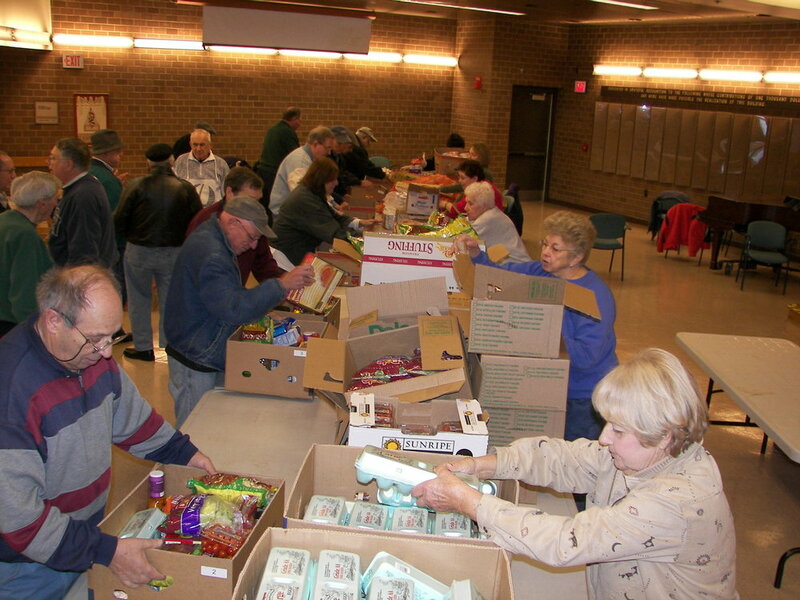 Many other charities and programs are supported by our Grand Lodges and Subordinate Lodges. 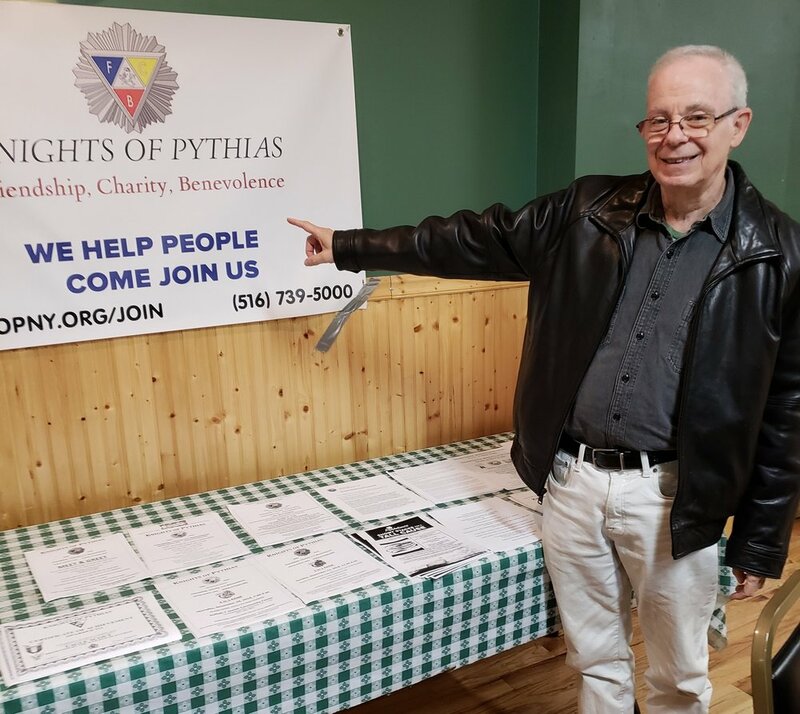 The real common thread throughout the Knights of Pythias involves our commitment to help people; when asked what we do, we answer quite simply: We volunteer! We help people! This common thread shows itself in everything we do. If someone approaches a Pythian and asks what we do, a Pythian simply lists the things that our order and the Pythian's home lodge does and asks them if they want to help volunteer. Each year, the Supreme Chancellor's Message, which outlines our annual program, reflects that imperative. For information on becoming a member of the Order of the Knights of Pythias please send request through our “Ask About Membership” form. A brother from your state will follow-up to assist you with information about our Order and the lodge nearest you. The Fraternal Order of Knights of Pythias promotes cooperation and friendship between people of good will. Pythians know one way to happiness is through service to mankind. Pythians believe that friendship is an essential ingredient in life. Pythians make Benevolence, Kindness, Generosity and Tolerance a reality in their lives. Pythians place home ties at the top of their priority list. We are in the process of redesigning our website to better assist our members and the communities they serve. This new design will contain areas for each grand and local lodge to have their own blog page and pages to express their unique personality. Please let us know what you think! Click <here> for a list of known Grand Lodge and Subordinate Lodge websites.